Silky smooth No Bake Cheesecake that takes minimal effort to prepare but tastes heavenly. 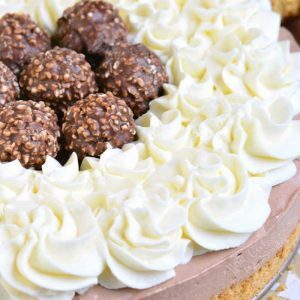 This gorgeous cheesecake is made with a layer of buttery graham cracker crust, silky Nutella cheesecake, and whipped cream cheese frosting on top. 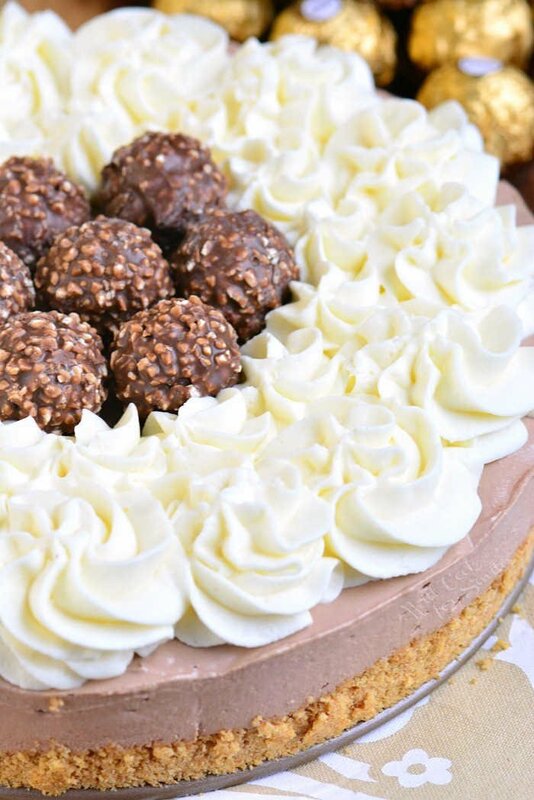 As a special surprise inside, there are chocolate hazelnut truffles hidden in the middle of the cheesecake. It’s a very easy cheesecake recipe made with few simple ingredients. There is no big secret about what is a no-bake cheesecake. It’s a cheesecake that has not been baked. A perfectly smooth, creamy, and silky cheesecake that takes a few minutes to mix and put together. Even though there is minimal effort that goes into making a no-bake cheesecake, you do have to be patient. The cheesecake needs to chill in the refrigerator for at least 6 hours. I do mean “at least 6 hours” because it needs a good amount of time to set. Ideally, the cheesecake would chill overnight. This no-bake cheesecake is not your ordinary cheesecake either. It’s a Nutella flavored cheesecake and it has a special surprise inside. 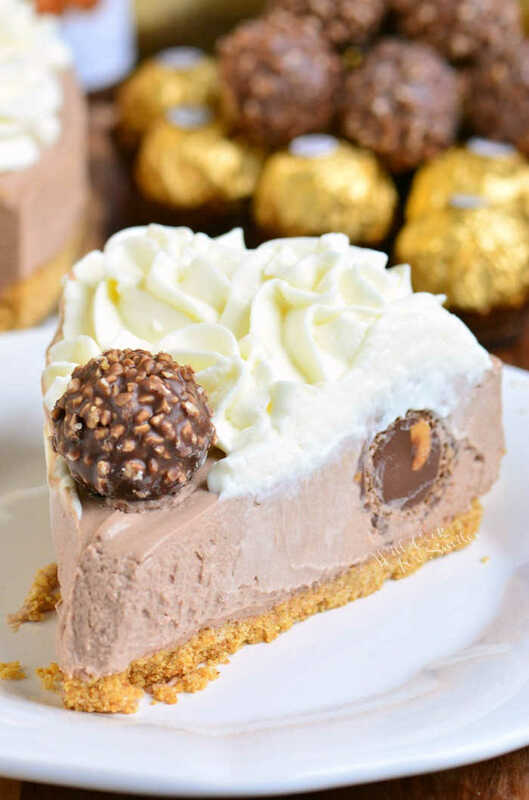 The cheesecake is filled with hazelnut truffles. How fantastic is that? 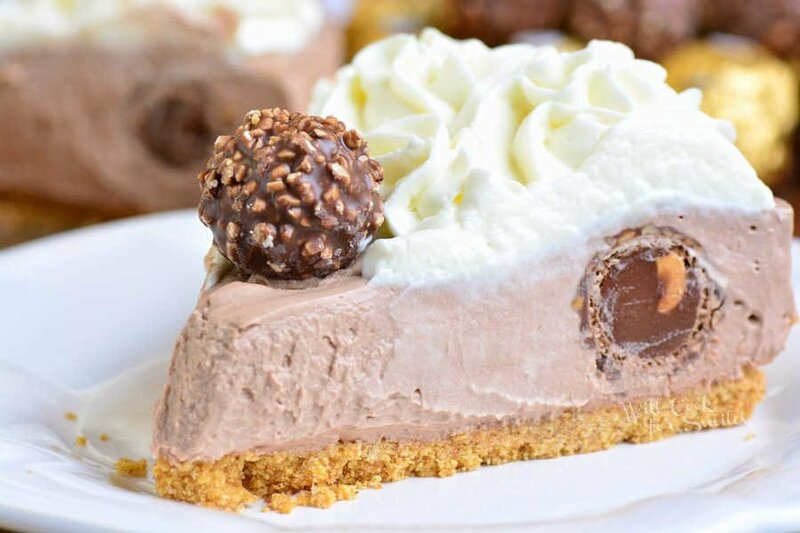 What helps this Nutella cheesecake be so creamy light and fluffy is the few simple ingredients and the process of making it. 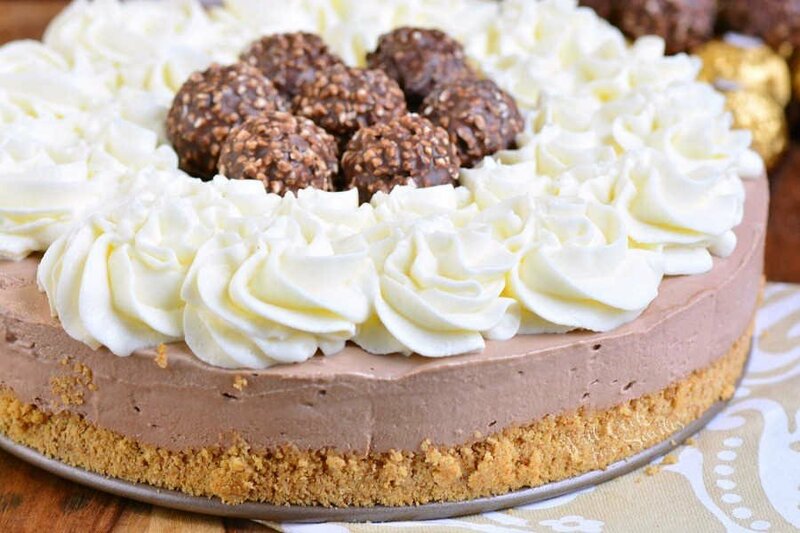 Nutella is a smooth and creamy chocolate hazelnut spread that adds a pleasantly creamy texture to the cheesecake. Whipped heavy cream folded into the beaten cream cheese creates a light and airy texture. To make the crust, you will need graham cracker crumbs, brown sugar, and butter. Melt butter in a microwave for a few seconds. Mix graham crackers and brown sugar until evenly incorporated and pour in melted butter. Mix well until all crumbs are evenly mixed with butter. DO still use a cheesecake springform even if the cheesecake is not going to be baked. Grease inside of the springform pan with cooking spray and pour in the graham cracker mixture. Spread the crumb mixture all over the bottom of the form and press it in tight. Set it aside to wait for the filling. To make the filling, you can either use two separate mixers or wash the mixer bowl out well between beating the cream cheese and heavy whipping cream. Make sure to soften cream cheese first. Use a paddle attachment. Beat softened cream cheese and Nutella together for a couple of minutes, until soft and fluffed. Scrape sides and bottom of the bowl and beat for a few more seconds. Use a separate mixer with a whisk attachment or change the attachment, take out the cream cheese mixture into another bowl, and clean out the mixer bowl. Add cold heavy whipping cream into the mixer fitted with a whisk attachment and start whisking on low speed. Gradually raise the speed to medium-high and slowly pour in sugar. Whisk until stiff peaks form. Fold cream cheese mixture and whipped cream together until completely combined. Spread half of the mixture over the prepared crust. 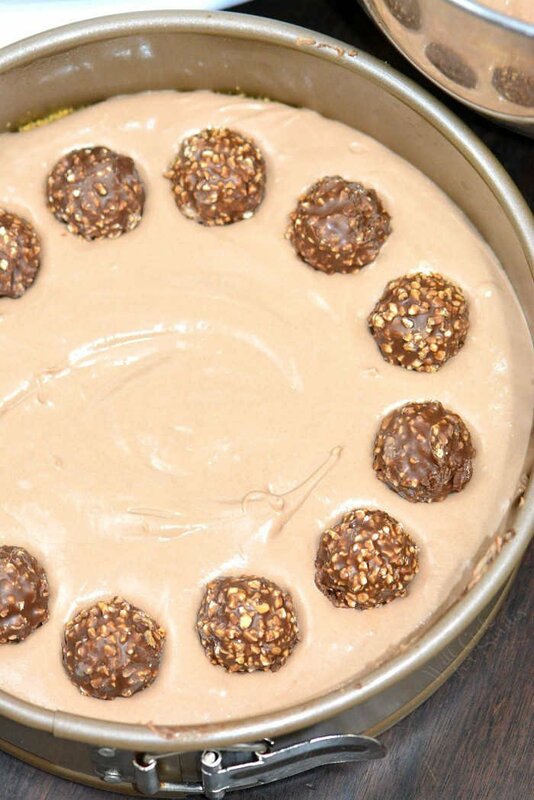 Place unwrapped chocolate hazelnut truffles around the perimeter of the cheesecake, in the cheesecake filling. Press them in lightly. Top off with remaining cheesecake filling and make sure it’s spread evenly. Cover with saran wrap tightly and refrigerate for at least 6 hours but ideally, overnight. 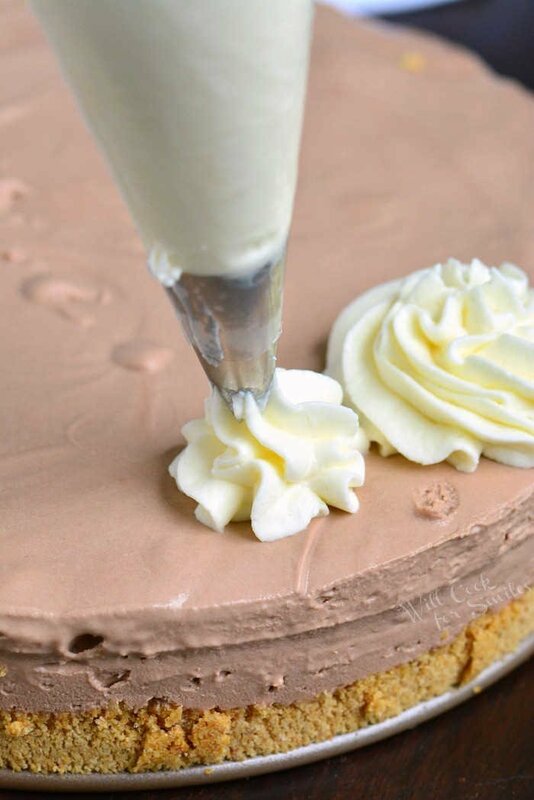 My Whipped Cream Frosting is a perfect frosting for this light and silky cheesecake. You can prepare frosting at the same time as the cheesecake or when ready to frost cooled cheesecake. For tip on how to store this frosting, check out the recipe post here. Fit a whisk attachment on the mixer. Start beating cream cheese for about a minute on medium-high speed. This cheesecake has to be kept refrigerated. You can store it in the same springform where it was prepared. Since the sides come off easily, cheesecake can be cut and served as needed. Cheesecake can be stored in the refrigerator for 3-5 days. Make sure to cover the top of the springform with plastic wrap to keep it air tight. If you plan to take the whole cheesecake out of the springform, make sure to line the bottom of the springform with parchment paper circle. Cut parchment paper about 1/2 inch bigger than the springform. So if you are using 9 inch springform pan, cut the circle that’s 9 1/2 inches in diameter. Do not add frosting to the cheesecake if you are planning to freeze it. Frost it after it has been thawed. Prepare the cheesecake as instructed and do let it chill in the refrigerator fist to set. Let it chill for 6-8 hours. Wrap cheesecake with several layers of plastic wrap and make sure that the first layer is flush with the top of the cheesecake. You can freeze cheesecake for up to 2 months. To defrost cheesecake, transfer it into the refrigerator and let it slow-defrost overnight. Tip: great thing about freezing the cheesecake in an aluminum foil pan is that it can be cut open without damaging the cheesecake. This gorgeous cheesecake is made with a layer of buttery graham cracker crust, silky Nutella cheesecake, and whipped cream cheese frosting on top. Use a paddle attachment. Beat softened cream cheese and Nutella together for a couple of minutes, until soft and fluffed. Scrape sides and bottom of the bowl and beat for a few more seconds. Take cream cheese mixture out of the mixer bowl and into a separate large mixing bowl. Switch to a whisk attachment and clean out the mixer bowl. Add cold heavy whipping cream into the mixer fitted with a whisk attachment and start whisking on low speed. Gradually raise the speed to medium-high as you slowly pour in sugar. Whisk until stiff peaks form. Before taking out the cheesecake, make sure to run a greased butter knife along the edge of the cheesecake inside the pan. This will help separate the cheesecake from the pan. Fit a whisk attachment onto the mixer and start beating softened cream cheese for about a minute on medium-high speed. Frost the cheesecake after it's been set. Decorate with some more chocolate hazelnut truffles if you wish. I love Nutella, and this is beautiful!